In the words of the late and the great Steve Irwin, “Crikey!”, that is some yummy looking sushi (no, he did not say that last part). My Friday night dinner challenge came in the form of something I never had the guts to make, until now! I (my mouth) was pleasantly surprised with the results. I purchased the sushi-rolling mat, but honestly, I did not need to use it. Maybe I got lucky with some super sticky rice that acted like a great adhesive, but I do think the overall trick of it was just to be delicate and not overfill the roll. 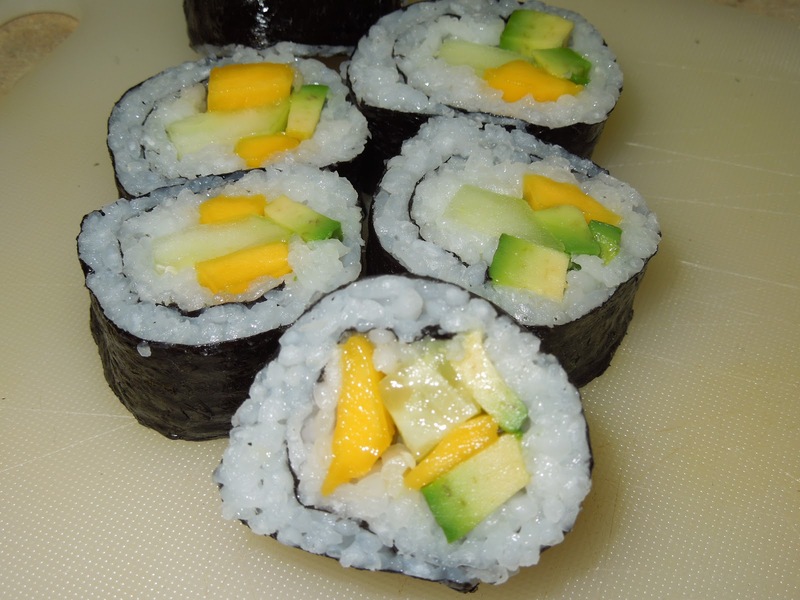 I do not have exact measurements for the ingredients in each roll, but I did take some pictures to illustrate the relative amounts. 1. 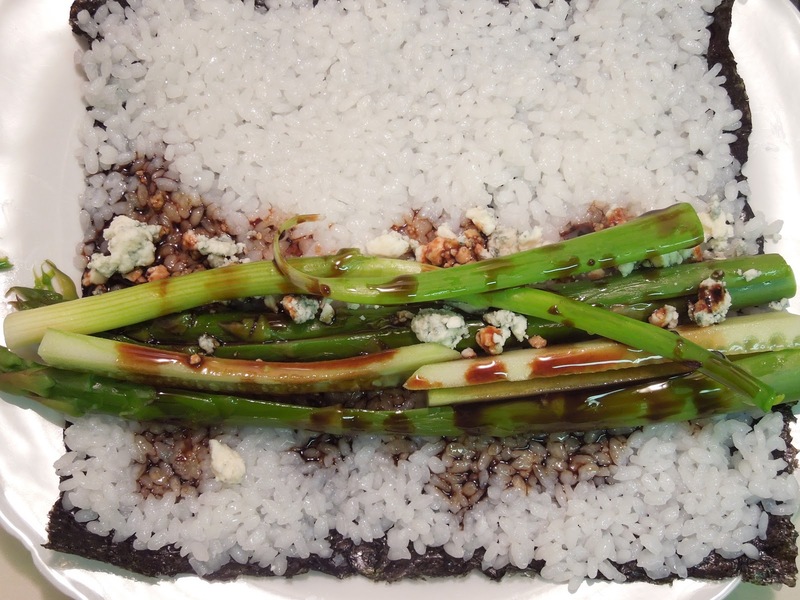 Prep your rice first, this way while it cooks you can chop up all of your produce. 2. Take the rice and rinse it under running water using a sieve. Do this until the water runs clear. Then place the rice into a pot with the water and bring it to a boil. Turn down the heat slightly once it does start to boil and let it cook for 10-15 minutes. All of my water was absorbed by the rice in around 10 minutes, but yours may take slightly longer, so check it after 10 minutes. 3. Once the rice is finished cooking, scoop it into a bowl, stir in the rice wine vinegar and store in the refrigerator until you are ready to use it. 4. For the balsamic reduction: Bring the balsamic vinegar, brown sugar and garlic to a boil in a pan. Once it begins to boil, immediately reduce the heat to a simmer and stir until it develops a syrup-like consistency (about 5 minutes). Remove and set aside for later. 5. 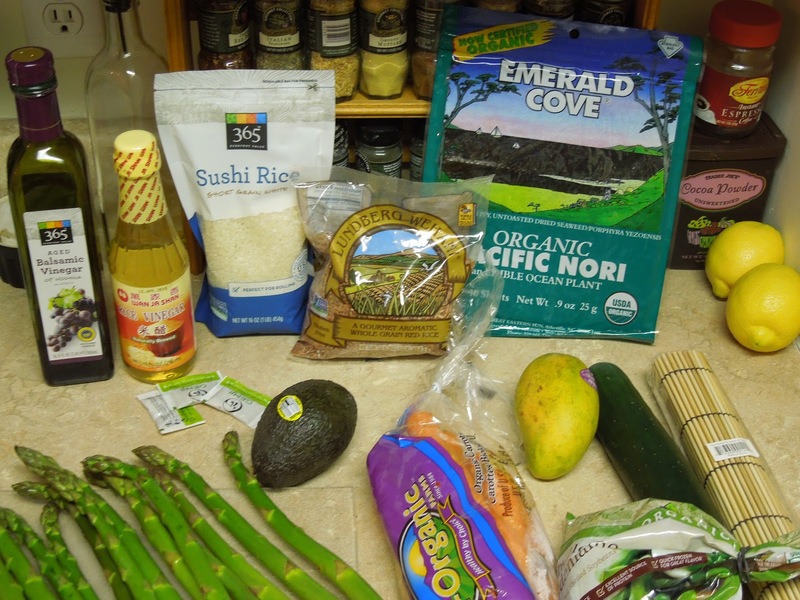 As soon as you have chopped up all of your veggies and fruit, pull out the rice and scoop out around 1/3 cup. 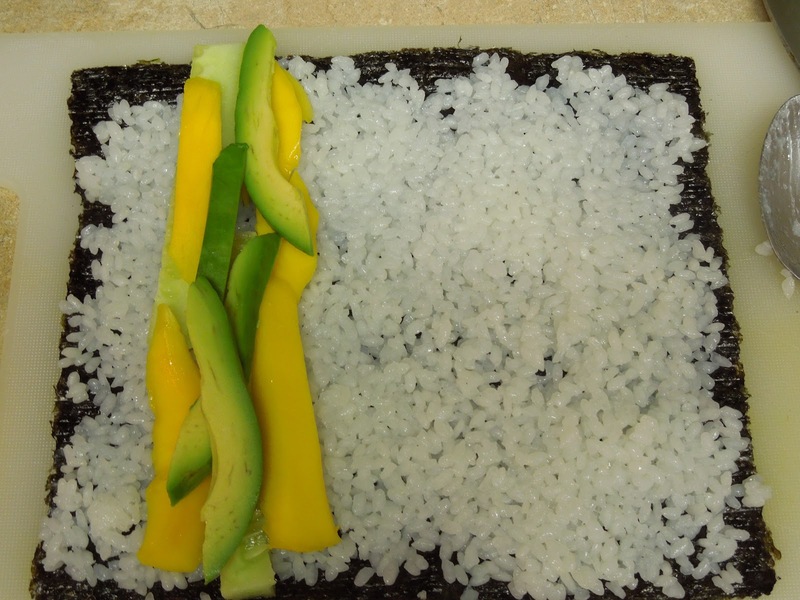 Each sheet of nori can be fully covered with 1/3 cup of rice, so after laying the sheet (rough side up) on a clean, flat surface (I used a cutting board), evenly cover the nori sheet with rice. 6. Then add your ingredients to one end (leaving a little over an inch between the edge of the sheet and the start of your veggies), do not forget to drizzle your respective sauces. 7. 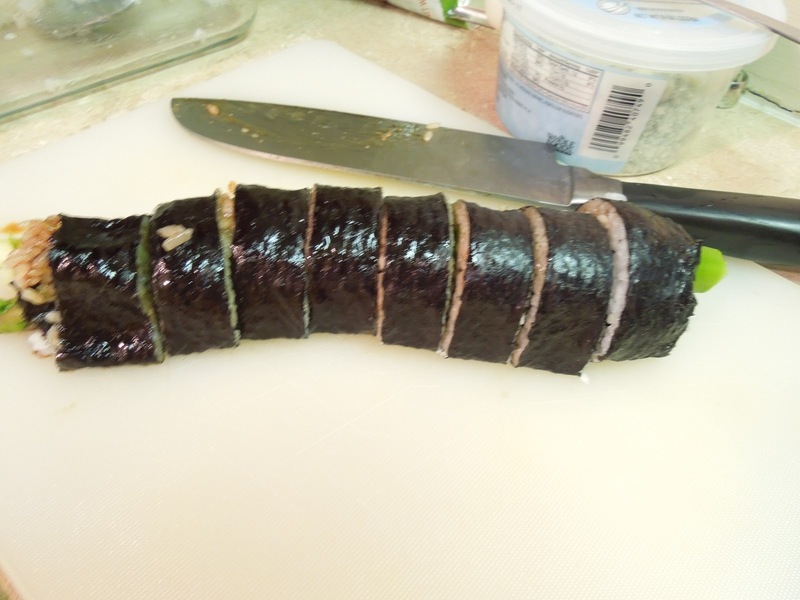 Now gently begin to roll your sushi. The best analogy I can make for this is imagine you are rolling up a teeny, tiny, puffy sleeping bag. You want to keep the sides as even as possible and you have to roll it slowly so nothing bulges out. 8. 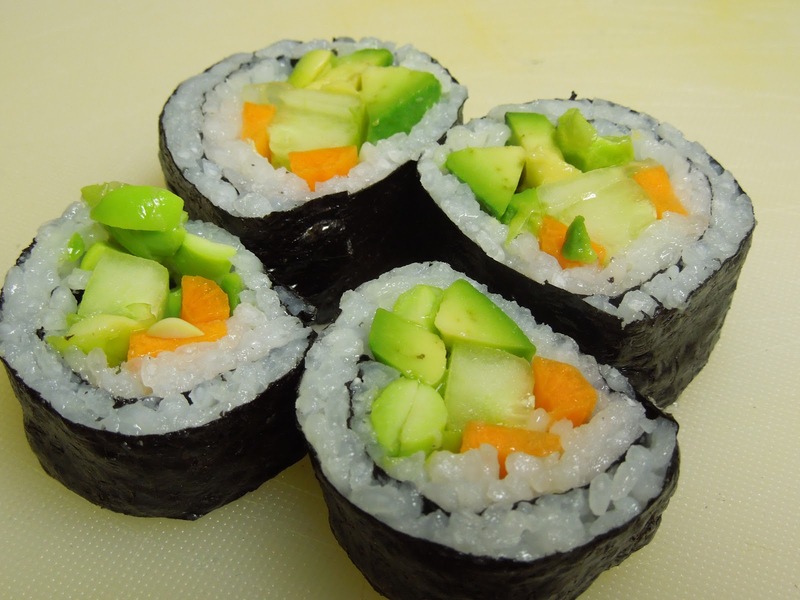 Once you have a uniform roll you can gently cut your sushi into individual pieces. 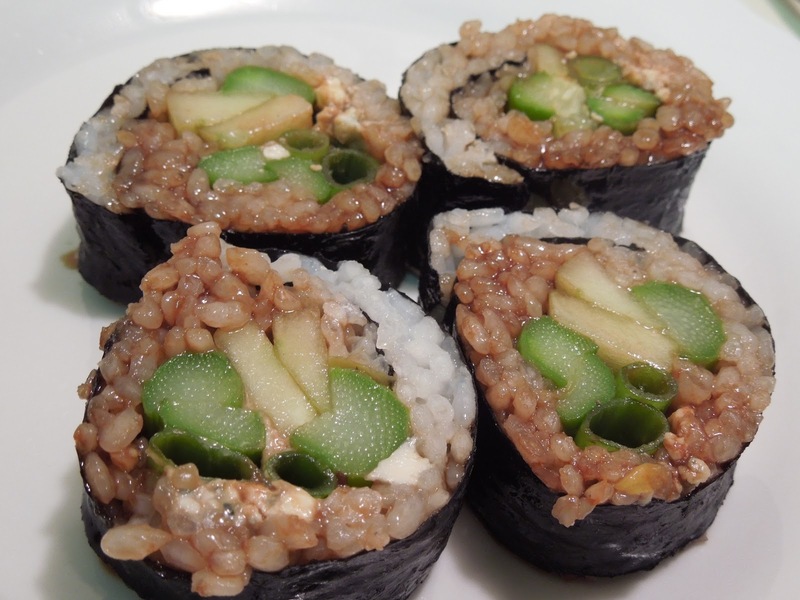 Then smother it in wasabi (or whatever you prefer) and enjoy!